This box contains 4 coasters and matching stand. Box has tears but coasters and stand are in good shape. Charley Harper. All images are approved by the Charley Harper Art Studio. 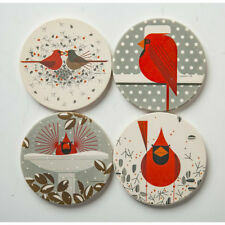 Set Of 4 Assorted Cardinal Stone Coasters. 1/16" Cork Backing Attached To The Backside Of The Coasters. Wooden Display Is Also Included. Charley Harper. All images are approved by the Charley Harper Art Studio. 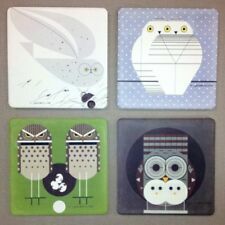 Set Of 4 Assorted Owl Stone Coasters. 1/16" Cork Backing Attached To The Backside Of The Coasters. Wooden Display Is Also Included. Frank Lloyd Wright. All images are approved by the Frank Lloyd Wright Foundation. 1/16" Cork Backing Attached To The Backside Of The Coasters. Set Of 4 Assorted "Rugs" Stone Coasters. 4 Slot Wooden Display Is Also Included. Charley Harper. All images are approved by the Charley Harper Art Studio. Set Of 4 Assorted Ladybug Stone Coasters. 1/16" Cork Backing Attached To The Backside Of The Coasters. Wooden Display Is Also Included. 4 Slotted Wooden Coaster Stand.